What a sad, non-gardening week it has been. The weather has been grey and rainy and sometimes downright chilly. There was frost north of the city in the wee hours of Thursday morning. The only days of sun came on Thursday and Friday when I was at work. My only consolation was being able to sit outside during my lunch break on those days. Bookman with his variable schedule, was off on the sunny days and got to enjoy a little weeding. I am not being facetious when I say he enjoyed weeding. Bookman likes to weed. So do I. There is something meditative about it. Plus you get the satisfaction of accomplishing something at the same time. The beans I planted last weekend are just starting to poke their heads above ground. I was also surprised to see the summer squash has already sprouted. The peas continue to go crazy and everything else is doing well too. Except the corn. Last week I discovered two corn sprouts and cheered because the squirrels didn’t completely win. I will have at least enough corn come the end of July for one dinner. I should not have counted my corncobs so soon. Bookman saw a squirrel out digging in the garden yesterday and this morning, no more corn sprouts. Curse you squirrels! They won in the matter of the corn this year. But I have learned my lesson and next year, there shall be tall cornstalks in my garden! With my luck though they will like those too and if not them then the raccoon I saw ambling across the street one night earlier in the week probably will. The apple trees are still blooming and looking oh so lovely. Clifford the Big Red Dogwood is also starting to bloom. When we planted Clifford we had no idea how big and wild he would get. He got a good pruning this spring but he is still large. After the flowers, it gets little berries on it that aren’t edible for us but the birds, especially the crows, love. I know a lot of people don’t like crows, but Bookman and I both do. They are such fascinating birds. Plus, they make Waldo go bonkers when they are out in the yard cawing. One night a year or so ago for some reason we were playing bird calls on the computer. The cats weren’t all that interested. Then we played a crow and Waldo leapt up and started running around looking out all the windows trying to figure out where the crow was. Of course that only egged us on to play it over and over until he traced the sound to the computer speaker and started prowling around it wondering how the bird could be in such a small thing. We laughed so hard we had tears in our eyes. Poor Waldo got really mad and huffed out of the room. He has since forgiven us, so please, no one report us for cruelty to animals. Speaking of birds though, the little sandy beach I made next to the frog fountain is a hit with the sparrows. I saw them out there rolling around in it Thursday evening. That is exactly what I had hoped for. A happy success. Dandelions are also blooming in the garden this week. I do love dandelions. I have had dandelion greens from the grocery store before but never plucked any from my own yard. This year I plan to add both greens and flowers to salads. I’ll let you know how that goes. The pussytoes are in bloom too. 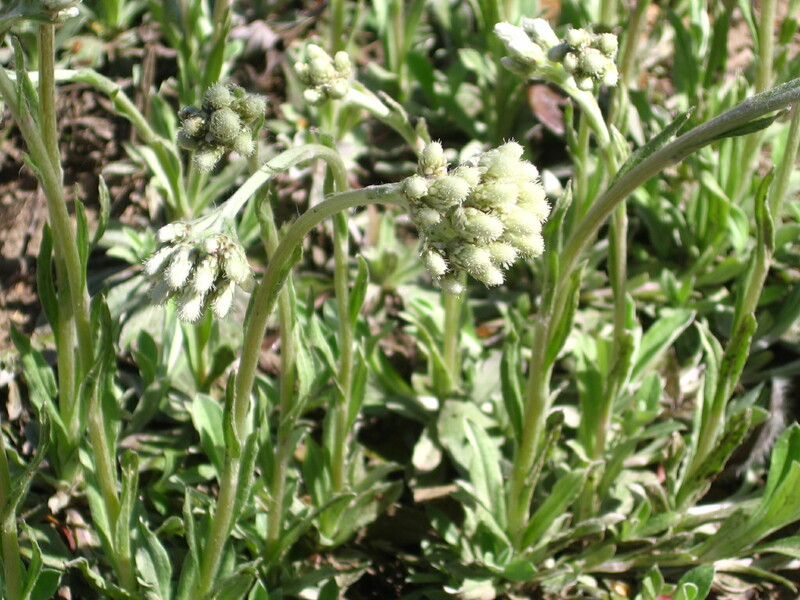 These are hardy little low-growing prairie plants with grey-green leaves that put up flowers in spring that look like little soft cat paws. Dogwood, dandelions, pussytoes, it’s an animal themed garden week! 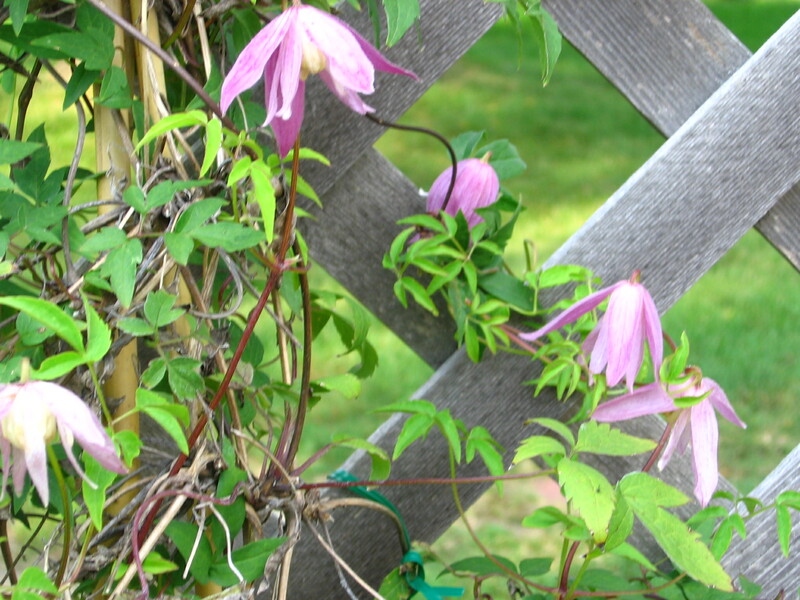 The alpine clematis just began blooming and is feeling a bit lonely for not being animal-y. It has a fairly long bloom time though and usually overlaps with the peonies. The peonies got a late start this year though so clematis might really be left all on its own. I don’t think there is anything about to bloom this coming week. The spiderwort maybe with its pretty purple-blue flowers. We’ll see! It’s the Canadian Well-Mannered Wildflower Invasion! Flee! Flee! Wait…. Sorry to hear about your corn! Miserable squirrels. Carrie, I know, it’s their disarming pleasantness that makes them so dangerous 😉 Squirrels are a pain but at least I am not also contending with rabbits which I’ve had to do in the past. 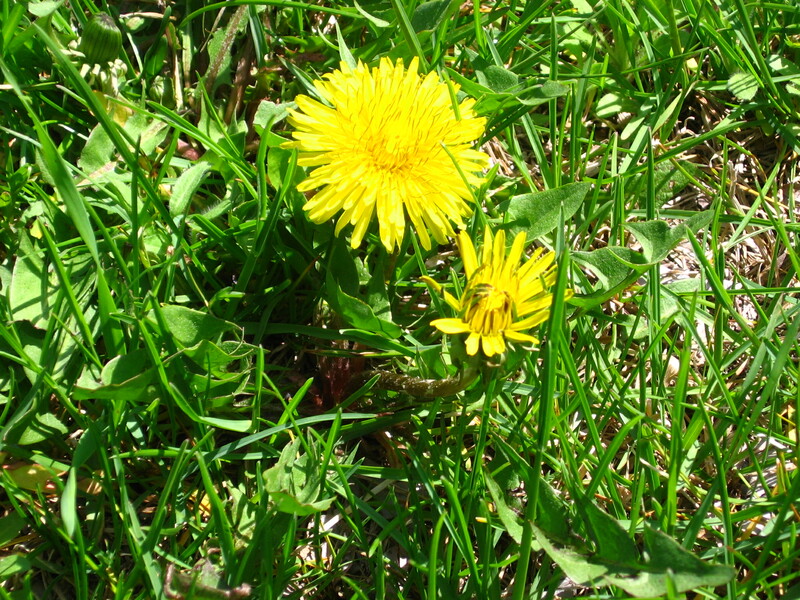 I guess I am a gardener after all and without actually trying even….I can grow masses of dandelions. Feel free to come and pluck as many from my backyard as you’d like to make a salad! There are far too many back there to weed, but I do try and keep the front lawn tidy. The squirrels, by the way, thank you (I’m sure) for planting such yummy treats for them! 🙂 Hope your weather improves and you get to spend more time in your garden this week. How fascinating about Waldo and the crows. I find them rather fascinating too and just picked up a book the other week – Mark Cocker’s Crow Country:A Meditation on Birds, Landscape and Nature.It must go on Waldo,s reading list. Ian, Waldo and the crows are a riot. Dickens doesn’t pay much attention to them at all so I don’t know what got Waldo so concerned about them. I’ve heard of Cocker’s book and am curious about it so let me know what you think! Danielle, see? I knew you had an inner gardener! 🙂 No doubt the squirrels are so thankful they left some sort of squirrel equivalent to a hobo sign on a fencepost to let all the other squirrels know what bounty might be found within. The weather didn’t really improve but I did some weeding anyway! Another lovely gardening post … love your animal themed plants. You are clearly a reader/writer to notice those! I realised recently that we have a lot of Chinese-themed trees in our yard: Manchurian Pear (2), Chinese Pistachio, Chinese Elm and Chinese Tallow Tree. How did that come about? Then we have an English Elm and a Japanese Maple. We only have about three other trees (a Gum, an Ash and a Pittosporum). A propos of nothing really except I found it intriguing. As for Crows – do yours sound as miserable as our Australian crows do. They have the most mournful sound. I wait with bated breath to see what flowers Colleen sent you. whisperinggums, how did you come by so many Chinese-themed trees? I suppose it is all about climate and what will grow. Do you get nuts on your pistachio? Never having heard an Australian crow I can’t say for sure is mine sound like yours. I wouldn’t say the ones here sound mournful though unless you consider lots of “caw! caw! caw!” as though someone were yelling and a gravely squawking racket to sound mournful 🙂 I won’t know what to call the flowers, but I am curious to see what sprouts from Colleen’s card too. Yes, I think it is the climate … Canberra suits exotic trees so we are quite famous for autumn colours which you don’t get in much of Australia. Your question re nuts reminded me that we have two Chinese Pistachio trees as well as two Manchurian pears. One of the Pistachios is male and the other female. One of them produces a seed (the female?) and its autumn colour is not as intense, but no, they are not the nut bearing species, more’s the pity. 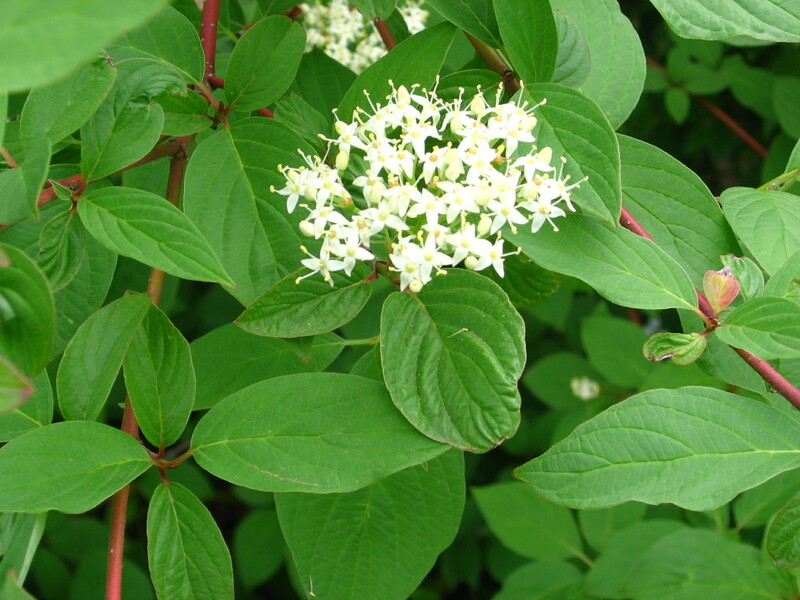 It survives very well in harsh climates and poor soils, both of which we have here. (We don’t have it as cold as, say, you have, but we have a lot of frost and a lot of very hot weather, and our soils are pretty clay-ey and awful). This You Tube is of an Australian Crow: http://www.youtube.com/watch?v=dmwqg1Usw_0 Imagine several of them at once … I can never resist calling back to them! whisperinggums, too bad your pistachios aren’t the nut-bearing kind. We had a Texas pecan tree in the backyard when I was growing up and we were never in want of pecans. We had so many my parents would give them away much to the delight of the neighbors. Now my parents have a macadamia nut tree that produces like crazy. Now I understand why you say the Australian crow sounds mournful! It sounds like a cat in pain or a child crying out. My crows cackle and screech. Fascinating how different they sound. Yes, child crying out is how I usually think of it. En masse they really get to me. As for the trees, it is a shame. My favourite childhood home – I had a few – had macadamia and mango trees (among others). I’ll never forget them! Mangoes growing in your own backyard. That must have been something! It sure was … a long time ago now, but something I don’t think I’ll ever forget! I LOVE mangoes. Before we moved to Philadelphia and gave up our house in the country with all its gardens, we had groundhogs. We’re of your ilk and we taught our dog not to chase ‘our’ groundhogs. Of course that meant that we needed to fence the garden. Did you know that groundhogs can climb? We didn’t. And when they had babies under the garden shed, we were amazed that the babies could pop through the chicken wire around the vegetable garden. Oh, well, we have grocery stores and they don’t. The topper was when I looked out on the patio and saw four teenage groundhogs lounging on the Adirondack chairs! All God’s creatures …. Arti, glad you like the title 🙂 We’ve had far too much rain lately but I am afraid to wish it away for fear we won’t have enough. Last year started off wet and then we had a severe drought over the summer. I would not be surprised if you were invading with maple trees. I have one in my front yard and a large part of weeding this time of year is pulling up tree sprouts from all the seeds it drops! Can you imagine that you can have a maple tree in your front yard and I don’t get to see one here in Alberta? No, they don’t grow here in this part of the country… only in the East or West coast Vancouver, a variety of it, not sure if they harvest syrup from them. So, the maple leaf on our flag, doesn’t represent us who live on the Prairies. Arti, maples don’t grow in your neck of the woods? Are you sure you live in Canada? 😉 There are so many varieties of maple that grow around here I don’t even know all of them. The one in my yard is a silver maple which I recently found out is native to the upper midwest. My street is also lined with maples planted by the city but I don’t remember what kind they are unfortunately. No sugar maples around to make syrup from but I do know there are areas of Minnesota where they thrive. How is it the maple leaf came to represent Canada when maples don’t even grow in a large part of the country? I’m at the other end of the gardening spectrum from you. Plants give up on me. Even though I love to see lush leaves and flowers, I’ve resigned myself to enjoying my neighbours gardens. It’s so marvellous to read about plants blooming and growing ! Your gardening posts inspired me to do a little planting this weekend (late for Georgia,so I mostly started with plants already on their way.) I planted 4 varieties of heirloom tomatoes (1 yellow pear, 2 pink, and 1 beefsteak), 9 sweet potato plants (if nothing else I think I’ll enjoy the vines, one zuchinni, 2 lavender (which may not survive our humidity) chocolate mint, basil, and thyme. I then sprinkled some sunflower seeds and dill seeds around. So, we’ll see. Everything is in containers – a kind of experiment, because the plants need to be moved around to capture enough sun. The backyard is large, but very shady – not good for vegetable growing. The front yard has abundant sun and no trees, but my neighbors would certainly take umbrage with my digging up the lawn and would certainly report me to the HOA (lawns are required by covenant – can you imagine?) So I have to resort to moving the pots around the back patio. If I leave work just a little early during the week, I can move them 2-3 feet south to keep them from under the shade of the house and provide them with a couple of extra hours of sun. I figure I’ve spent $160 and will be lucky if I harvest $10 worth of vegetables. But the fun is worth the other $150. Grad, Hooray! Are the sweet potatoes perennial in your area? We have to grow them as annuals here. I’ve never tried, but I am thinking next year I might give them a go even though Bookman says he doesn’t like sweet potatoes. How can you not like sweet potatoes? It’s really too bad the HOA won’t let you have a garden in the front yard where all your sun is. Maybe you can start a revolution and get the rules changed? If your experiment works this year, it won’t be so expensive next year since you will already have the dirt and the containers. Be sure to let me know how it goes! The weather has turned awful here, too, just as all my plants are flowering, sigh. Oh those pesky squirrels! They must have had a campaign map and some excellent organisation. You’ll beat them next year! And pussytoes is just the cutest name for a plant, ever. Litlove, I think the squirrels are very good at spying. They hid out, watching me so they knew exactly where the corn seeds were. I love the name pussytoes too. I don’t have a good place to grow pussywillow so these make a pleasant, and small-sized, alternative.